Disney's A Christmas Carol tells the classic tale of Scrooge, played by Jim Carrey, for the age of digital animation. LOS ANGELES (AP) — Jim Carrey's Scrooge is collecting holiday donations from movie fans with a $31 million opening weekend to take the No. 1 spot with his new take on "A Christmas Carol." 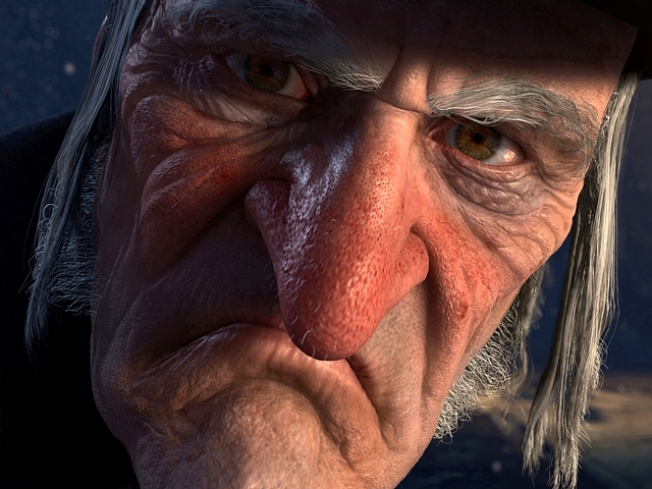 The Disney animated version of the Charles Dickens classic features Carrey as Ebenezer Scrooge and as all three Christmas ghosts that show Scrooge the error of his miserly ways. The movie was shot with the same performance-capture technology director Robert Zemeckis (zuh-MEH-kihs) used on his 2004 holiday offering "The Polar Express." "Christmas Carol" came in ahead of "Polar Express," which had an opening weekend of $23.5 million. But it fell well short of the $55.1 million opening for Carrey's previous holiday tale, "Dr. Seuss' How the Grinch Stole Christmas" in 2000.